The Bug Boys: Videos worth sharing. I was surfing You Tube and ran across a couple cool videos I thought were worth sharing. The first one is about a cool old Ford that a guy bought from an old moonshiner. The car is awesome and I imagine it was very hard to beat back in it's day. The 2nd one is an interview with Billy Gibbons from ZZ Top. He is a car nut and has some of the coolest cars around. The Cadillac shown in this video is almost to good to be true. I love the car guys that actually get out and drive their cars. He is one of them. I love the quote "having fun while you go from point A to point B is always the order of the day." I couldn't agree more with that! Halloween is fast approaching. 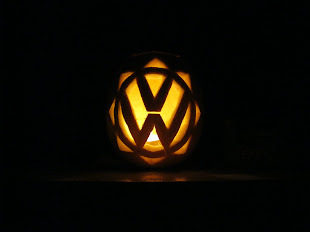 Not sure if I will have time this year to carve a cool pumpkin or not. I haven't had any ideas pop up in my head for a good one. Check back and see what happens.